Researchers recently suggested cycling could reduce the risk of cancer - and now a campaign has launched urging people to get on two wheels. A team at the University of Glasgow found those who cycled to work every day had a significantly lower risk of cancer and heart disease. 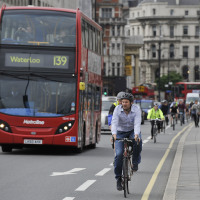 Now in a separate development a nationwide campaign is aiming to get millions of Brits biking. The campaign from Cycling UK and Halfords will see events being held up and down the country, and the introduction of a National Bike Week in June. The benefits of biking to work? Going back to the University of Glasgow study, the risk of developing cancer fell by 45% for those who cycled to work - with a similar reduction in heart disease risk. If you have suffered cancer or heart problems you can arrange specialist medical travel insurance. Paul Tuohy, chief executive of Cycling UK said: "This great new partnership with Halfords will really help Cycling UK to get more people cycling more often. "With over 460 Halfords stores adding their support to our 67,000 members, we will help to get more Britons into cycling."